I am happy to inform you that a new major version of Ab2d.ReaderSvg was just published. This update should greatly improve reading css styles from svg files. But because css styles can be incredibly complex, there are still cases that are not supported. Luckily, the main tools that can save to svg files usually do not use such complex css styles and therefore Ab2d.ReaderSvg should be able to read almost all the files. An important new feature is also that ReaderSvg class now has two new delegates: BeforeWpfObjectCreatedCallback and AfterWpfObjectCreatedCallback. The first delegate is called before ReaderSvg creates a WPF object from the svg element. The delegate gets the xml text that is used to define the element. 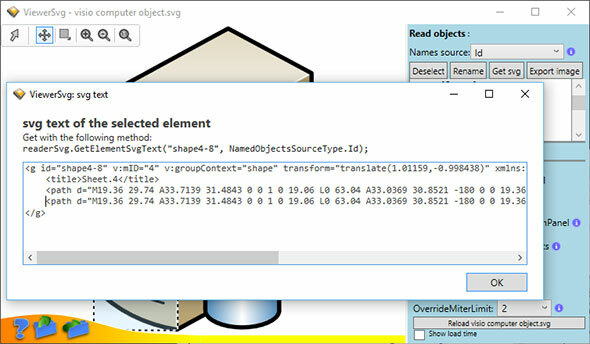 It can be used to create your own WPF object from the xml and pass that back to ReaderSvg. The other delegate is called after the WPF object is created by ReaderSvg. It gets the created WPF object and the xml text. This delegate can be used to read some additional properties from the xml and decorate or change the already created WPF object. There are also some other improvements and fixes. The whole list can be seen on ReaderSvg versions history web page. This shows that though the main focus of the AB4D company is on developing components for 3D visualization, the 2D tools and importers are still fully supported - most of the updates are based on the great feedback from the customers. So, if you get a svg file that is not correctly imported or you have a good feature request, please send me the svg file or a feature request. I am happy to announced that a new version of Ab2d.ReaderSvg is available. 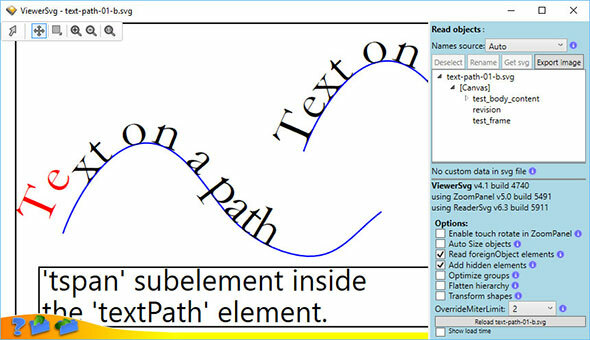 As shown in the image above, the ReaderSvg now supports textPath svg element that positions text on a referenced path element. Fixed reading text decorations (Underline and Strikethrough). Added support for reading metafiles embedded into image's base64 encoded string. Added support for reading images in foreignObject created in Microsoft Visio. Added ReadForeignObjects property to Ab2d.ReaderSvg that enables or disables reading foreignObject elements (enabled by default). Added support for reading data from number lists that end with comma - for example the following string in svg file was not read: "12, 34, 56,". Improved writing images in XAML. They are now written in more clear format. Also fixed setting Source for images that are created from foreign objects. As alwasy, the customers can get the latets version from their User Account page. Others can try the new version with downloading the evaluation version. And if yuo find a svg file that is not read correctly, please send it to me and I will my best to improve ReaderSvg.